... there was a cycle speedway team called the “Flowerpot Flyers” later "(Flowerpot) Saints" - even wearing "Simon Templar Logo" breastplates! On Saturday nights they went to St Matthews Youth Club in Newtown, Exeter where they stood on chairs and mimed to the hits of the day - Beatles, Freddie and the Dreamers etc – greatly influenced by the new TV show called “Top of the Pops”. They then decided, at the ages of about fifteen, that they were getting on a bit to ride pushbikes and came upon the idea to form a group. It was virtually - Tommy (Searle) you play drums, Brian (Sandy) rhythm, Chris (Forte) bass, John (Gregory) lead and Roger (Collett) singer. The “Spartans” were born in Fortes Ice Cream Factory, Preston Street, Exeter - using the ice cream van as group transport - 809 AFJ. Chris, Brian, Tommy, Roger & John - note the equipment. Left - Brian, Tommy, Roger, Chris & John. This line-up lasted about two years. Picture taken at St Georges Hall, Exeter - now the Corn Exchange. Humphrey Loram was the roadie and he was persuaded to take up the organ and he replaced Brian on 04/06/65. Right - Chris, Roger, John, Humphrey & Tommy. Humphrey left in 29/07/66 & the group continued as a four piece. During the three years or so of the "Spartans" there were a few temporary additions to the group – Janet Perks on vocals and Graham Sclater on organ to name two. A couple of their claims to fame were auditioning for "Opportunity Knocks" - but failed! & topping the bill at the Flamingo Club Camborne/Redruth, Cornwall, 24/12/66. The support band was the "Reaction" fronted by Roger Taylor - later with "Queen". John struck up a close friendship, through school and college, with Ian “Bud" Street and their target was to form a new band and turn professional. During this transformation period of 1967 Alan Curtis (brother of Tony in "Contraband") was lead singer for a short while. John & Bud rehearsed with numerous drummers. Mick Collins was the choice but he would not turn professional & then after auditioning close on twenty drummers Cliff Andrews was chosen. “Clockwork Orange” was used temporally as the chosen and closely guarded secret was to be named the “Graded Grains”. In the mid-sixties there was a band called "Marmalade" & on the bass drum front skin there was a “gollywog” found on Robertson's jam - this logo is not used now as it is classed as racial! John & Bud tried to think of a well-known logo and “Fred” came along from Homepride. "Fred" was, and still is, on their product and one of the famous lines was “Graded Grains make finer flour”. In 1967 flower power was creeping in from California and they played on the words with flour/flower power. A bit deeper there was a hint of drugs with the expression “graded grains” and in the period 1969-1971 pot, speed and LSD was taken – hastily to add not John! 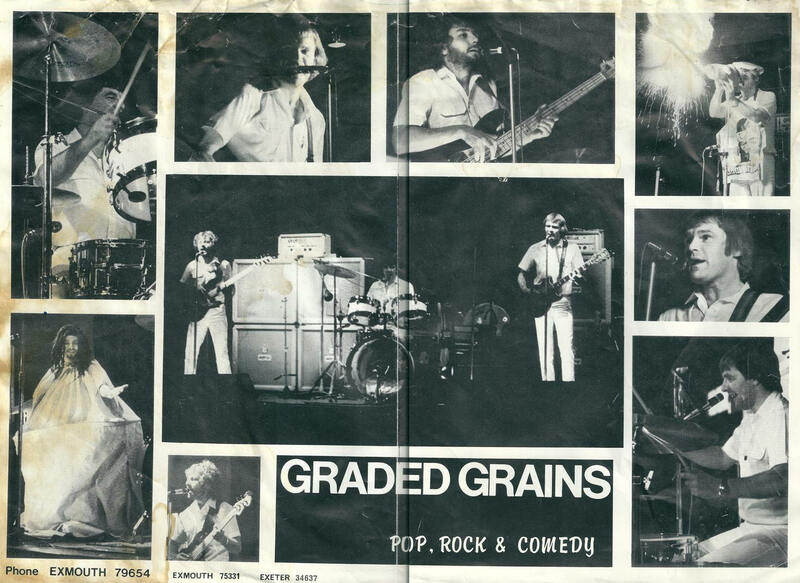 The name the “Graded Grains” was launched at the first official professional gig at “Butlins”, Minehead on 29/07/67. Left - Cliff, John & Bud. Lesley Ireland was added to the line up for the six month tour of Germany 1967/68 – a girl singer was a necessity for the basically all male clubs. With the tour over Cliff became uneasy and he was replaced by Tommy – from the “Spartans” days and then Terry Pascoe was added on organ. Middle - Bud, Tommy, John & Terry. This was probably the best musical line-up of any of the groups and was very successful on tours in Germany, France and Italy. A couple girl singers were used in Germany but their names have been long forgotten! The group spent a lot of time in Germany near another Exeter group called the “Magic Children”. Roger from the “Spartans” days was now playing the organ, John Carpenter – a close friend of the “Graded Grains" was on drums, Dave Meakal on lead guitar and Paul “Harry” Crane on bass. On their return from touring the two groups divided. Tommy & Terry went with Dave & "Harry" and continued professional as the “Magic Children” and the “Graded Grains” carried on semi-pro with the two Johns, Bud and Roger, now as lead singer. Alan "Brad" Bradbury was also in the line-up for a while on organ. Right - John (Carpenter) and Roger - sorry no pictures of "Brad". This group carried on until 29/05/71. During the Graded Grains Mk 1 period the band did a lot of support roles to the top bands of the era – "Who", “Cream”, "Searchers", "Swinging Blue Jeans", “Free”, “Traffic”, “Move”, "Amen Corner", "Pretty Things", "Family", “Crazy World Of Arthur Brown” etc. It came to an end when Bud was offered a more lucrative job with “Gary Kane and the Tornadoes”. John spent the next year trying out various ideas. Firstly a lot of time rehearsing with a new band in Exmouth - John & Ray Kemp on dual lead, "Harry" from the "Magic Children" on bass & Richard Harvey on drums. This never got on the road. John then formed “Contraband” which immerged on 29/04/72. Left - Trevor Pugsley on organ, Tony Curtis on bass, John & John Carr on drums. This line up lasted about a year. Trevor & John (Carr) was replaced by Trevor Inch on rhythm guitar and Gary Gray on drums. Right - Trevor, Tony, Gary & John. During this year John made a couple guest appearances with "Gary Kane and the Tornadoes”. Bud and Dave Smale (drums) wanted John to stay as a permanent feature but Gary Kane would not part with the services of John Greenslade (lead guitar). Bud and Dave left “Gary Kane & the Tornadoes”, John left “Contraband” and the “Graded Grains” were back. The picture on the left of Bud, Dave & John is sadly the only photo available to date & probably taken at The Waye Country Club, Ashburton circa 1974/5 - Bud just about got in the picture! Dave left after about nine months and was temporally replaced by Rob Shaw until a more permanent member was found in Steve Orgee. Middle - Steve, Bud & John. This line-up did a lot of work and was featured on BBC Radio 4 “Morning Sou’West” many times and BBC TV “Spotlight Southwest” and even a live radio broadcast from the “Devon County Show”. Comedy was beginning to creep into the act. Steve left in September 1976 and was replaced by Gary from “Contraband” days on 29/09/76. Right - Gary, John & Bud. This line-up lasted nearly ten years - a lot of work & fun - 1160 gigs. Probably not the best musical line-up but the three complimented each other. Bud was the best musician, John was a good front man & stand-up comic & Gary's impressions & comedy sketches rounded off the act. They had a brilliant sound system & lighting rig helped by the roadies – Rod, Paul, Clive, Mike, Malcolm, John, Pete and many more. The white suits were ditched near the end of their "reign" & replaced by white jeans & shirts and even white shorts with union jack t-shirts on the last set of the gig! This final rather tatty publicity handout was taken in the early eighties. During the ten years only one stand-in was used - Andy Carpenter (brother of John) on bass as the band did not want to cancel some lucrative gigs for a fortnight while Bud was unavailable. The final gig was on 31/01/86 when the group was taken off the road to make time for the opening of “Crediton Snooker Club” (now “Potters”). The "Graded Grains" never materialised again. In the twenty two years the band supported many acts but sadly not the Beatles or the Rolling Stones - the Who was the biggest claim to fame! 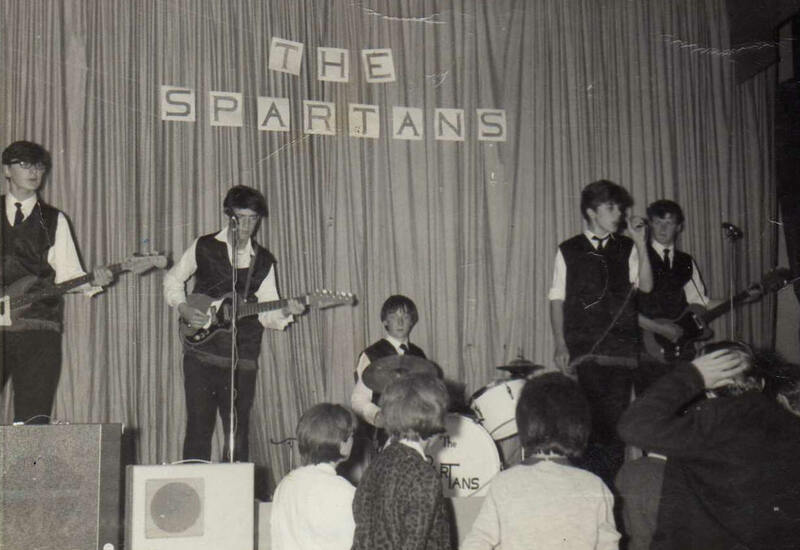 Another claim to fame was on 24th December 1966 the "Spartans" topped the bill at the "Flamingo Club" in Camborne/Redruth, Cornwall. The support band was the "Reaction" - the drummer was Roger Taylor - with "Queen"! In 1984 John & Bud bought the old cinema, in Crediton, intending to turn it into a night club & call it “Prides” – (Home)Pride - even "Fred" was to be weaved in the carpets. Planning and licence was refused and after a lot of hassle the building was converted into a snooker club - "Crediton Snooker Club" >> “Potters”.